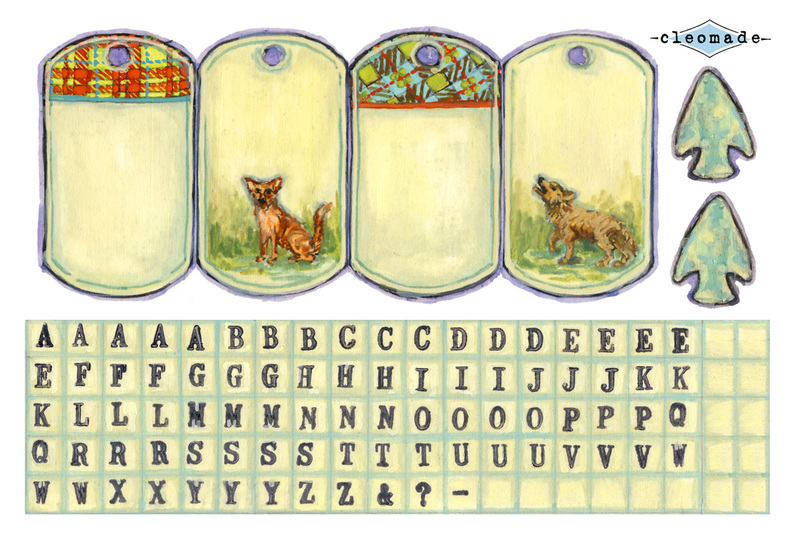 These dog tags make a fun camping craft for kids. Write your phone number on the back in case little kids wander off. Or, get a shorter chain, and use them as a backpack ID tag/charm for back to school. FIG. 1 Supplies: Two 24” lengths of ball chain and connectors (found at a hardware store), hole punch that fits the chain diameter (I used a small chain and hole), printout, pencil, chipboard (thin enough to cut with scissors), scissors, tacky glue, hemp or natural fiber cord, decorative tape (optional). FIG. 2 Here are two options for the tags: with a taped edge, or without. Both start by cutting out the tags and arrowheads artwork. For the taped edge version, trace around the tag on the chipboard. You’ll need two copies for each tag. FIG. 3 To make the version without tape, glue the art to the chipboard and cut around the outside leaving a small (1/16”) border of chipboard showing. Then add the art to the other side. Punch a hole, and that’s it. FIG. 4 Back to the taped edge version. Cut just outside the line. Punch a hole in the top. It will look just like fig 3 but the art is not glued down. Make two pieces of chipboard and glue them together. FIG. 5 I used gold duct tape, so I had to cut it down to ½” wide. Washi tape would be nice too, and already the correct width. Wrap the tape around the tags so it is only sticking to the edges. Cut four notches at each curve and fold over the tabs. FIG. 6 Smooth all the edges flat. FIG. 7 Glue on the artwork and re-punch the hole. FIG. 8 Cut out, and glue letters to spell your name or a funny phrase. FIG 9 The arrowhead tassel. Glue one side of the arrowhead to chipboard, cut around it, then add the art to the other side. Cut a 12” piece of cord, double it up, and tie an overhand knot in the end to make a loop. Make another overhand knot about ½” down. FIG. 10 Wrap another piece of twine around your hand 6 times leaving the ends hanging down. FIG. 11 Tie the first cord around the looped cord with a square knot, leaving the ends hanging down. FIG. 12 Cut another 12” length of cord. Lay it across the looped cord, just under the knot. Place the arrowhead on top and cross the cord back over. FIG. 13 Flip the whole stack over – facing down on the table. FIG. 14 Bring the cord ends, which are crossed over the arrowhead, around and tighten them up to make the top of the tassel. Tie a square knot. FIG. 14 Trim the ends, and thread the tags and tassel onto the chain.